Many home owners are unaware of the cause of the stains on their roof shingles. 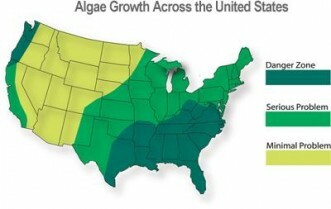 It is caused by a algae that feeds on the limestone filler that shingle manufactures put in the shingle as a filler to add weight to the shingle when they switched to a fiberglass base. The shingles were too light which increased the claims filed as a result of wind damage. As if that wasn’t bad enough, many roofers have taken advantage of this lack of understanding to sell more premature roof replacements. I recently quoted a roof cleaning job on a home with a 13 year old roof. Ultimately, the homeowner was convinced that she needed a replacement and made her decision to spend $8000 versus $400 simply because the roofer insisted that I was unqualified to “inspect” a roof. While I am not a “certified” roof inspector, it’s not rocket science, however, I’ll concede the point and simply ask this question…if the shingles came with a 25-30 year warranty, why is the homeowner not getting a free replacement? If the roof is unserviceable after just 13 years, why would someone take the word of the company that installed a product that lasts less than half of the period of guarantee? Q. My contractor is offering a one-year warranty on my asphalt shingle roof system-is that the industry standard? Second, the roofing contractor will provide you with a warranty on his workmanship. Typically, this will cover installation and related issues. The warranty should contain what items are covered and what will void them. Many contractors offer one year or two years of coverage; however, there is no industry standard. Since it is impossible for workmanship to cause a shingle to develop an algae related stain, it has to be related to the manufacture. If it need’s replaced after less than half of the 25 year warranty, it must be defective. If you bought a new transmission for your car and it had a 3 year warranty, worked fine but was dirty…would you replace it after 1 1/2 years? If the mechanic stated that it needed replaced, wouldn’t you expect them to honor the warranty? 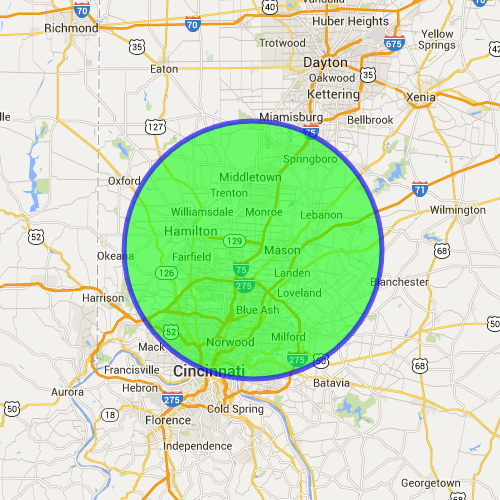 We have been cleaning roof stains in the greater Cincinnati and Dayton area since 2007. 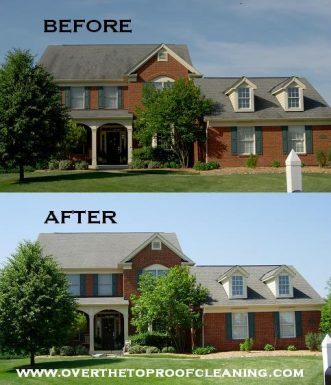 For a free no hassle non-pressure roof cleaning that will remove ugly roof stains, call us at 513-341-8444. 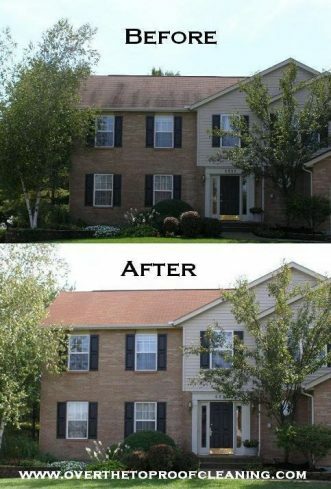 The roof stains on this Loveland home were an unwanted eyesore for the homeowner, but she made the decision to call us and now when she pulls into the driveway she sees a clean, new-looking roof. The is typical reaction is Wow! The algae on this roof in Sharonville was so advanced that it blocked almost all of the original shingle color. Three hours later the black algae was gone and the roof looked brand new. 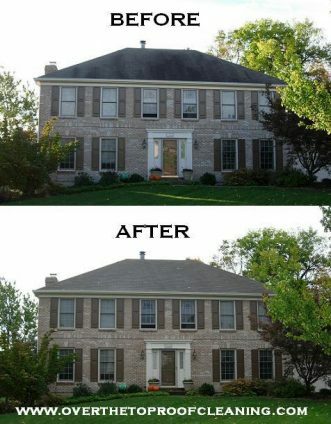 This gorgeous home in Terrace Park was in desperate need of a professional roof cleaning. 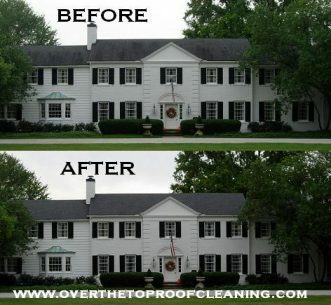 The homeowner called Over The Top Roof Cleaning and those black stains are now history! Roof Cleaning Mason We cleaned the roof of this beautiful Mason home, and the homeowners were thrilled to be rid of the black roof streaks that were tarnishing their curb appeal. 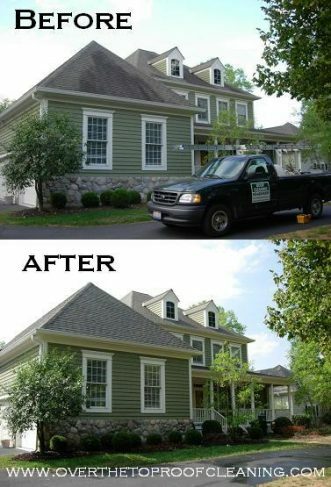 Now when people drive by they notice the house and its stunning landscaping, not the ugly roof stains. 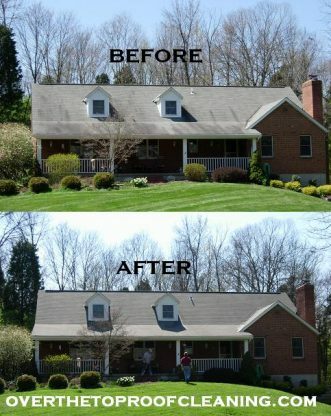 Roof Cleaning West Chester Ohio The algae streaks on this West Chester roof were no match for our zero-pressure cleaning system. We cleaned this roof on a warm day last fall. Instant curb appeal!